You'll receive this quest from Berath when you pray to him inside Teir Evron in Elm's Reach (#2). Note: If you don't know how to pray to Berath, then please refer to the quest entry for Council of Stars. Berath will send you a vision, and in it you'll see an elven woman and a dwarven man. The woman will mention the Golden Grove, and the man will mention the Ethik Nol, and Berath will order you to "return them to the Wheel" -- that is, kill them. For more information about the elf, you should head over to the Golden Grove (#3). When you talk to Iswld there, she'll tell you that High Ovate Erona is their leader, and that she often travels to Elmshore. 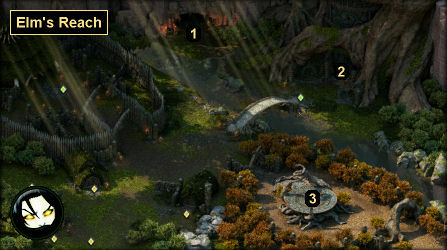 In Elmshore, you'll meet the Erona at the stone circle on the eastern side of the map. With Resolve 15, you can convince Erona to kill herself, which will earn you "major" reputation bonuses with the Golden Grove and the Ethik Nol. Otherwise, you'll have to kill Erona and her guards, and you'll find a Ring of Protection and more when you loot their corpses. For the dwarf, you should go to Blood Sands (#1), the home of the Ethik Nol. In the Blood Sacrifice Chamber in the back of the cave, you'll meet Archdruid Rehstin. He won't offer to kill himself, so you'll have to attack him directly. Rehstin will drop the unique sabre Purgatory when he dies, and you'll also earn an "extraordinary" reputation bonus with the Golden Grove, but you'll lose "major" reputation with the Fangs and "extraordinary" reputation with the Ethik Nol. Also, everybody in Blood Sands not named Keeper Wrdha will turn hostile to you (including Naca, who is involved in the quest True to Form), and you'll lose "major" reputation with the Ethik Nol for each kill. After completing your assassinations, when you return to Berath (#2), he'll grant you his favor, which you might need for the quest Council of Stars.